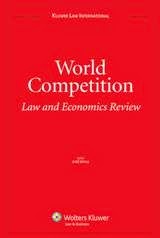 "The Meaning of Restriction of Competition Under the Monopolistic Agreements Provisions of the PRC Anti-Monopoly Law"
Abstract: International attention on the People's Republic of China PRC Anti-Monopoly Law (AML) has mostly focused on merger control and abuse of dominance. Enforcement against restrictive agreements and concerted practice seems to have been overlooked so far. This article examines how the Chinese courts and enforcement authorities have analysed restrictive agreements. Specifically, it focuses on how the courts and the authorities have applied the concept of restriction of competition in monopolistic agreement cases. With respect to horizontal cases, one largely unanswered question is whether anticompetitive effects need to be proved even in cartel cases or a proof of the mere existence of the agreement suffices. With respect to vertical cases, there remains much confusion as to the appropriate analytical framework for resale price maintenance (RPM), the per se rule or the Rule of Reason, and whether Article 14 of the AML applies to agreements beyond RPM. This article attempts to shed light on these important questions. Thomas Cheng was recently featured in the German Antitrust Blog, D'Kart (26 June 2017).